ALS Research Forum | Fate Accompli—Cells With NG2 Become Oligodendrocytes, Drive ALS? Fate Accompli—Cells With NG2 Become Oligodendrocytes, Drive ALS? Progenitor cells that produce the chondroitin sulfate proteoglycan NG2 are a little bit neuron and a little bit glia, leading scientists to think that upon differentiation, they could morph into one or the other. But in the November 17, 2010 online edition of Neuron, scientists report that there is actually only one future for NG2-positive cells: oligodendrocytes. That fate appears to be sealed for NG2+ cells both in health and in disease, according to the study authors at Johns Hopkins University in Baltimore, Maryland. First author Shin Kang and senior author Dwight Bergles examined the NG2+-to-oligodendrocyte transformation in healthy mice and in an amyotrophic lateral sclerosis (ALS) mouse model, where these glia proliferate alongside dying motor neurons. Their work is the first to implicate oligodendrocytes in ALS. Although the role of these cells in pathology is unclear, the authors suggest they may participate at an early stage in the disease process. No one ever anticipated the NG2+ cells or the conversion to oligodendrocytes would be important in ALS, said collaborator Jeffrey Rothstein, who studies the role of astrocytes in ALS, also at Johns Hopkins. That kind of stood us on our head a bit. Similarly, in a paper published December 1, 2010, in the Journal of Neuroscience, researchers led by first author Richa Tripathi and Bill Richardson of University College London, U.K., report that the vast majority of NG2+ progeny in a mouse model of multiple sclerosis are oligodendrocytes. NG2+ cells constitute 5 to 8 percent of cells in the central nervous system (Stallcup, 2002). They lack axons, but possess projections much like dendrites that form synapses with nearby neurons (De Biase et al., 2010; Bergles et al., 2010). Their dual nature has fueled the idea that the cells might have the capacity to differentiate into different cell types, including neurons, said Bergles. In culture, scientists have caused NG2+ cells to morph into oligodendrocytes, astrocytes, and neurons (Kondo and Raff, 2000). And in vivo, according to the scientific literature, NG2+ cells can become many kinds of cells, including interneurons (Aguirre and Gallo, 2004; Aguirre et al., 2004; Belachew et al., 2003), principal neurons (Guo et al., 2009; Rivers et al., 2008), and astrocytes (Guo et al., 2009; Zhu et al., 2008; Zhu et al., 2008). To examine NG2+ cell fates, Kang and Bergles devised a system based on Cre-Lox DNA processing to label NG2+ cells and their progeny with green fluorescent protein (GFP). NG2 is expressed in other cell types, including some microglia, making it a poor choice to tag the population in question. Therefore, the scientists turned to the platelet-derived growth factor α receptor (PDGFαR), which turns on only in NG2+ precursor cells, and generally not in other glia or neurons. Using the PDGFαR promoter to drive transgene expression, they employed a form of Cre that can only enter the nucleus in the presence of tamoxifen, allowing the scientists to precisely time GFP production. Kang crossed these mice with a line containing a GFP gene preceded by a floxed stopper sequence (Novak et al., 2000). To examine the fate of NG2+ cells in young animals, the scientists treated four-day-old mice with tamoxifen, then sacrificed the animals at various time points over a four-week period. The labeled cells proliferated in the corpus callosum and dorsal cortex, then lost the PDGFαR marker as they began to differentiate. They gained Olig2 and Sox10, markers for immature oligodendrocytes; and finally expressed APC, a marker for mature oligodendrocytes. A similar, if slower, maturation pattern played out in older animals when the researchers activated Cre at 30 or 70 days of age. Over a period of two to four months, the labeled cells lost their PDGFαR and expressed Sox10, Olig2, and eventually APC; they also took on the branched appearance of oligodendrocytes. Bergles was surprised to observe abundant oligodendrocyte differentiation in adult animals. He hypothesizes that oligodendrocytes in adults normally turn over slowly, and that NG2+ cells replace lost oligodendrocytes as needed. At the Society for Neuroscience annual meeting, held 13-17 November 2010 in San Diego, California, Kang presented further data to support this hypothesis. He showed that when he selectively ablated most, but not all, NG2+ cells in mice, the remaining cells quickly proliferated and repopulated the cortex within weeks—that is, they maintained a steady-state level of NG2+ cells. The scientists searched among their GFP-positive cells for evidence of astrocytes or neurons, as well. They never observed cells bearing the astrocyte markers glial fibrillary acidic protein (GFAP) or aldehyde dehydrogenase, nor did they see astrocyte morphology. They did spot the occasional NeuN-positive neuron expressing GFP, but these were rare, with fewer than one in 500 GFP-positive cells. The scientists suspect that these neurons were not new nerves arising from NG2+ precursors. Green neurons were apparent just a few days after tamoxifen treatment, yet it takes weeks to grow a neuron—so to have come from the NG2+ cells, these neurons would have to have developed with uncharacteristic speed. Therefore, the authors suspect that those few neurons expressing GFP must have been neurons or nearly differentiated neurons that happened to express PDGFαR at the time of tamoxifen treatment. Given that NG2+ cells are multipotential in culture, the single-fate results are astonishing, said Ben Barres of Stanford University in Palo Alto, California, who was not involved in the study. I would have bet money against it, he told ARF. The oligodendrocyte results match previous in vivo experiments in rats (Levine et al., 1993; Horner et al., 2000; Levison et al., 1999), but they conflict with many other studies using similar Cre-Lox systems. In these, scientists observed astrocytes and neurons with the fluorescent label, implying those cells also descended from NG2+ cells. In those studies, Bergles suggested, the original fluorescent tagging might have included cells other than NG2+ ones. Most of those studies did not take the crucial step to ensure specificity of expression of their transgene, he said. It is quite likely that there were other cells that were labeled. For example, Guo et al. (2009) used a proteolipid promoter to control Cre expression. When Kang and colleagues studied the same mouse line, they discovered that astrocytes and neurons, too, activated that promoter. David Pleasure, of the University of California at Davis, led the Guo study. In an e-mail to ARF, he acknowledged that his labeling may not have been specific enough. However, he noted that Bergles and colleagues have not fully explained the 2008 results of the Richardson group in London: Rivers et al. 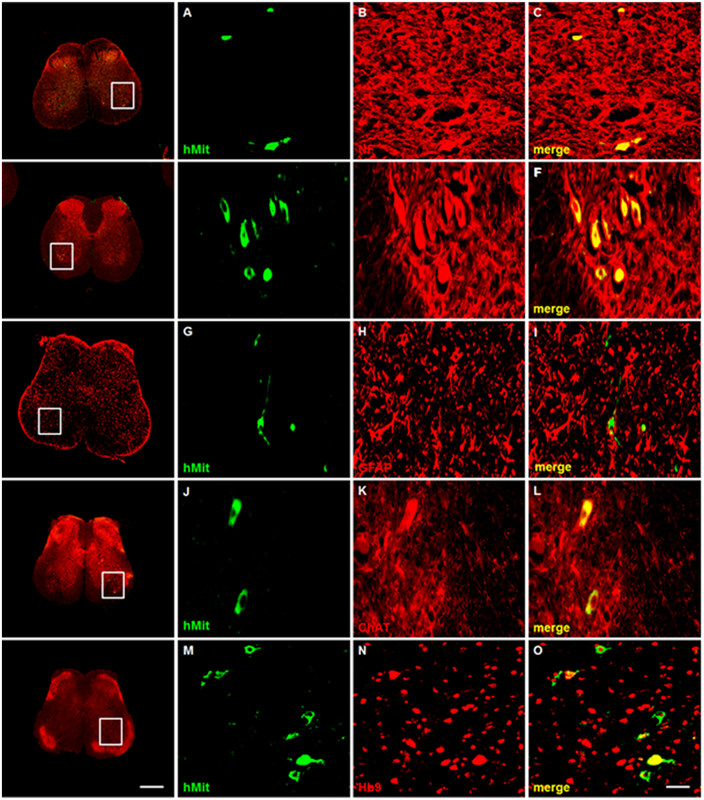 (2008) observed fluorescently tagged neurons in the anterior piriform cortex of mice that expressed Cre under the PDGFαR promoter, just as in the current study. Richardson also questioned this discrepancy. The new neurons are real, and not a figment of [our] collective imagination, he wrote in an e-mail to ARF. He suggested some possible explanations. For one, each lab created its own PDGFαR promoter construct, and may have selected slightly different regulatory elements that led to Cre expression in neural precursors in only one mouse line. Also, Richardson and colleagues only observed the new neurons in the piriform cortex, and he speculated that Kang might have missed them if he did not look in precisely the right spot. In their December Journal of Neuroscience paper, Richardson and colleagues reported using their PDGFαR-Cre-Lox system to tag NG2+ cells and descendants with yellow fluorescent protein (YFP) in a mouse model for multiple sclerosis. They observed that YFP-positive cell numbers in the spinal cord quadrupled during demyelination, and more than 90 percent of the YFP cells were of oligodendrocyte lineage. They also observed that between 1 and 2 percent of YFP-positive cells expressed the astrocyte marker GFAP, and fewer than 0.02 percent expressed NeuN. Thus, they concluded that spinal cord NG2+ cells give rise primarily to oligodendrocytes—results mostly in line with the Bergles report. However, Richardson is not ready to slam the door on multiple possible fates for NG2+ cells. It still seems possible that NG2+ cells have the potential to generate cells other than oligodendrocytes, he wrote. It will be a challenge to identify conditions or signals that encourage these different pathways. Might those conditions include disease and injury? It is this question that led Bergles to team up with Rothstein and examine NG2+ fates in ALS mice. NG2+ cells are known to proliferate in response to injury (Levine et al., 2001), and studies have suggested that following trauma, NG2+ cells give rise to astrocytes as well as microglia (Sellers et al., 2009), Schwann cells (Zawadzka et al., 2010), and pericytes (Sellers et al., 2009). Furthermore, scientists have reported that NG2+ cells proliferate and generate astrocytes in ALS (Magnus et al., 2008). Kang, Bergles, and Rothstein employed a common model for ALS—mice overexpressing human superoxide dismutase 1 (SOD1) with the G93A mutation that causes the disease in people. They used BrdU to label dividing cells in the pre-symptomatic (75 days old), symptomatic (90 days old), and end stage (120 days old) of disease, and two days later examined oligodendrocyte populations in the spinal cord. Before symptom onset, the number of Olig2-expressing cells was similar between mSOD1 and wild-type mice. By the symptomatic stage, mSOD1 mice had quadruple the number of Olig2+ cells as did control animals. At end stage, the mSOD1 mice had 20 times more Olig2+ cells than did wild-type mice. Since Olig2+ cells are on their way to becoming mature oligodendrocytes, these results suggest active proliferation of oligodendrocytes in the disease. Barres deemed the massive increase in oligodendrocyte proliferation a novel kind of gliosis. To test if mature oligodendrocytes arise from NG2+ cells in ALS, the authors crossed their NG2+ reporter mice with the mSOD1 mice. They injected tamoxifen at 60 days of age, and then examined the animals two months later when they reached endstage disease. They found more GFP-expressing cells in the mSOD1 animals than in control reporter mice, and many of the cells had dropped the PDGFαR marker in favor of the mature oligodendrocyte marker APC. No GFP-labeled cells had NeuN or GFAP—in contrast to Richardson’s recent findings—implying that in ALS mice, NG2+ cells still produced only oligodendrocytes. In unpublished, follow-up studies, the researchers found that oligodendrocytes in ALS mice were malformed and died. In another mouse line, they also selectively deleted mSOD1 in oligodendrocytes, and discovered the animals survive months longer than mice with mSOD1 in all cell types. It is the largest effect ever in slowing disease onset, Rothstein said. And at the André-Delambre Symposium on ALS, held 24-25 September 2010 in Québec City, Canada, Rothstein reported that in preliminary examinations of postmortem tissue from people who had ALS, his group sees changes in proliferation and morphology of NG2+ cells that match the changes in the mice. Given the malformation and death of oligodendrocytes in ALS spinal cords, the authors believe that oligodendrocytes are part of ALS pathology, although they can’t say yet whether as a cause or effect of the disease. How might motor neurons and oligodendrocytes interact in ALS? Oligodendrocytes manufacture myelin and insulate axons, speeding up action potentials’ travel times. But at the same time, myelination restricts axons from accessing the extracellular milieu, making them dependent on the engulfing cells for nutrients and trophic factors (Nave, 2010). In particular, Rothstein is examining the lactate transporter MCT1 as a possible mediator by which oligodendrocytes nurture neurons. In Québec, he reported that MCT1 knockdown led to motor neuron degeneration. And at the San Diego conference, Rothstein presented a poster with evidence that oligodendrocytes express MCT1 in vivo. The simplest idea is that this novel gliotic response is a secondary effect to abnormality in this diseaseit may not have any significance other than that, Barres said. Another possibility is that it has some protective response[the oligodendrocytes] may be helping in some way. Another possibility is that they are hurtful. Barres also suggested that in cases of spinal cord injury, NG2+ cells might still give rise to astrocytes. Bergles sketched out two scenarios for how oligodendrocytes and motor neurons could get sick together. If the motor neurons ail first, they might damage oligodendrocytes. NG2+ cells would then rush to fill the void, but without solid axons to encircle, the oligodendrocytes they form would fail to adopt proper structure. Alternatively, Bergles speculated that oligodendrocytes could be among the earliest cells to deteriorate. If so, then they could not nourish neurons, leading to motor neuron degeneration. We might be seeing a primary injury of the oligodendrocytes, instead of the motor neurons, in this disease, Bergles said.